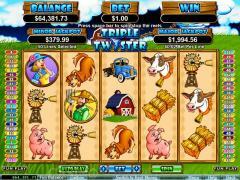 Triple Twister is an online slot game from Realtime Gaming. Twister, or tornado, is the wild symbol and Triple Twister because it triples the payouts. The reels are set in the background of a field and a twister can be seen approaching. During the free spins the background changes to inside a barn and the heavy downpour can be seen outside. The other symbols on the reels are from a farm. There is the Farmer, his Wife, the Barn, a Cow, a Pig, a Dog, a Windmill, a Tractor, a Van, a Bucket and Hay. The scatter symbol is the Weather Vane. Triple Twister has a two level progressive jackpot. Both are triggered randomly and can pay after any spin. These are not as large as the normal jackpots. Triple Twister has 50 paylines and all of them are compulsorily enabled. The players are constrained to wager one coin per line. Hence there is no need for a Bet Max button. The coin denomination however can be varied from 0.01 to 5.00. This gives freedom to players with all sizes of bankrolls. The Twister wild symbol is a little different in this slot game because it also substitutes for the scatter symbol. This advantage is compensated by having the scatter symbols appear from left to right. The highlight of Triple Twister is the Triple Twister feature. 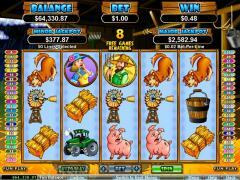 When three or more scatter Weather Vane symbols appear left to right 9 free spins are awarded. 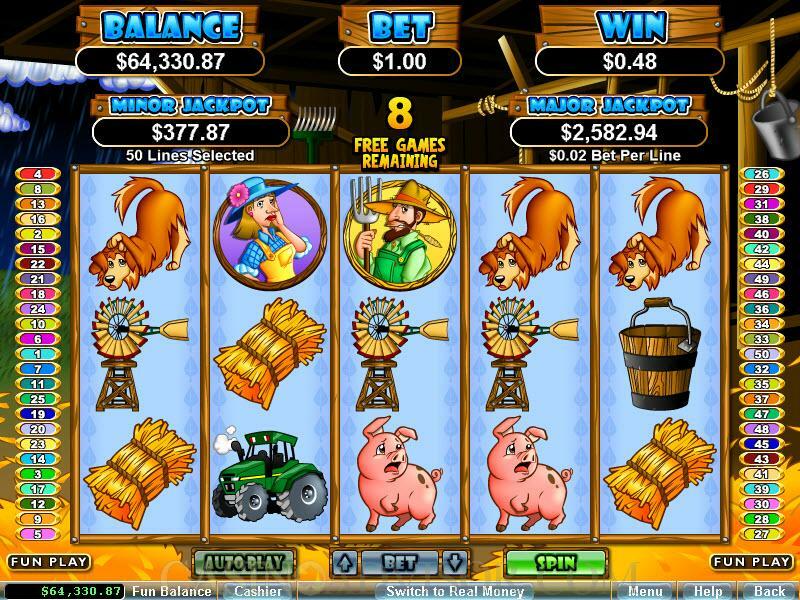 Whenever the Twister symbol appears during the free spins it not only expands to cover the entire reel but can also replicate itself onto 1 or 2 additional reels and payouts are then calculated. 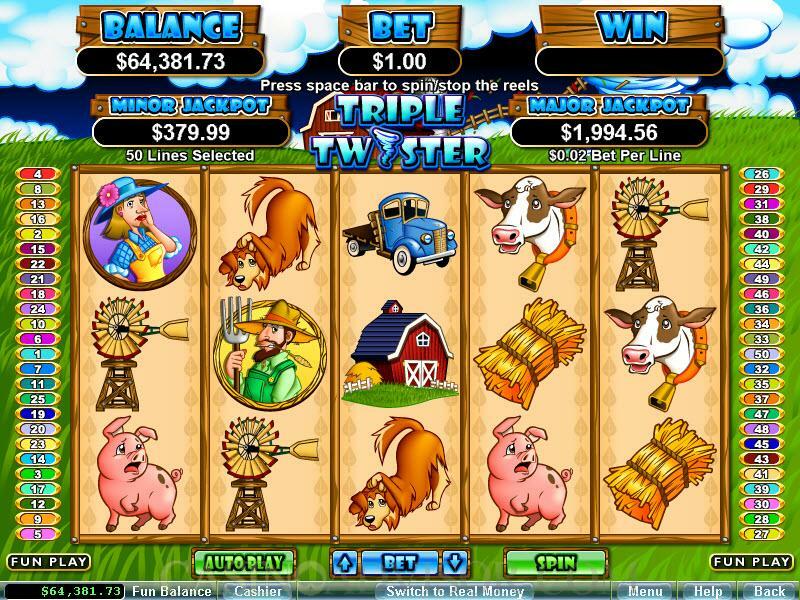 The Triple Twister feature can be retriggered if three or more scatter Weather Vane symbols appear left to right during the free spins. The retriggering scatters are counted before the Twister replication eliminates them. The Triple Twister feature is expected to offer a payout of more than 10 times the triggering bet. If this happens then the player is taken back to the base game. If not then the Win Win feature comes into operation. In this feature there is no game play, only bonus prizes are awarded. If the player does not win anything in the Triple Twister feature he is awarded a bonus of 100 times the triggering bet. If the player’s win is up to 2 times the bet his bonus is 8 times the bet. If the player’s win is from to 2 times to 5 times the bet his bonus is 3 times the bet. If the player’s win is from to 5 times to 10 times the bet his bonus is 2 times the bet. Interested in reading more detailed information about Triple Twister? If so Click Here for more details.